"Now we rise and we are everywhere." That bolded words above me are carved into the back of Nick Drake’s headstone, and are another reminder of the constant self fulfilling prophecy of perhaps one of the greatest songwriters of the 20th century. The relevance is startling, considering his resurrection after his death, the growing popularity he possessed only after his body was lowered and rotting into dust. But that’s the way things sometimes are, right? Life isn’t always fair, or just. 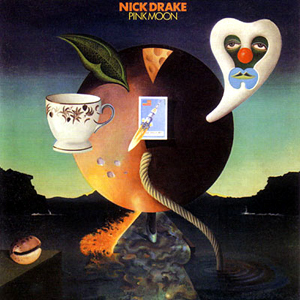 Pink Moon is Nick Drake’s final album, and it’s haunting acoustic requiem, recorded over only a few nights, a sound that is very minimal yet very piercing. The only song to have an accompaniment is Pink Moon, the first track, and it is only a wistfully beautiful piano melody. But my god, it’s wonderful. Place To Be is a song of tragic alienation, a song that goes back into the past of a man who knows what it is to be on the edges, an outcast by birth, and in death a legend. Road is another beautifully sad song. When I say beautifully sad, I mean a sad that is almost bittersweet, it isn’t oppressive, rather it is liberating, knowing that is a dirge and is a conduit to release emotions through, as all the best sad songs are. Every song on this album has a bit of that spirit in it. Which Will is a song that almost blends in with every song on the album. His chord progressions, tones, mood, lyrical content and acoustic guitar are all connected, like this is one piece of music. The chorus is one of the better parts of the song. Horn is a beautiful little instrumental. The first few strums of the guitar in this song remind me of ‘Heroin’ by The Velvet Underground. Things Behind the Sun is the longest song on the album, clocking in at just under four minutes long. Once again, I feel like I am being repetitive because this album is so interconnected, it gets to a point where I just have to say, listen to it, it’s beautiful. Harvest Breed is a brief and sad song, mentioning finding friends, but mentioning a fall, as if Nick knows the end is approaching. From the Morning is the final song on the album. I find it poignant that Nick Drake’s last song on his last album has a positive angle to it, the title containing the word morning, a time of a new beginning, a time where the sun rises and gives all people a chance at redemption. Let’s hope they grasp it before it’s too late.